Shifting winds threaten oil camp workers as wild fires continue to burn. A newly released satellite photograph details the impact of the ongoing wildfires around Fort McMurray in Alberta, Canada. 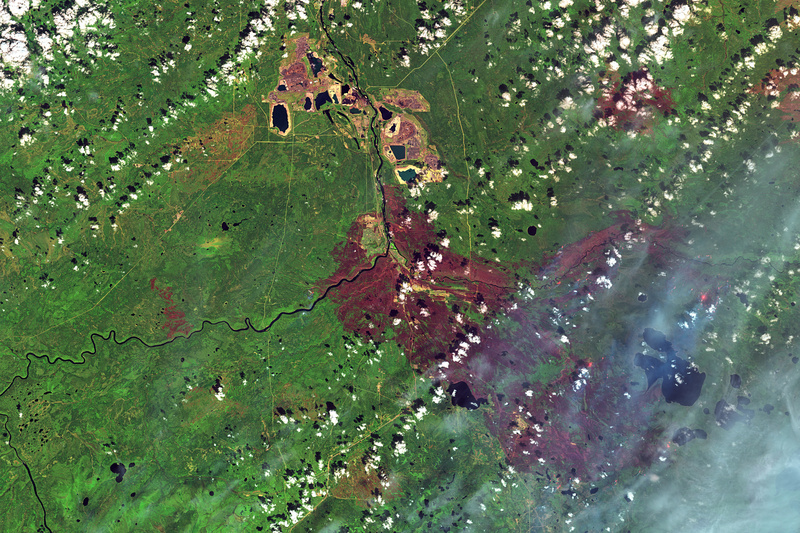 Acquired by the Operational Land Imager on the Landsat 8 satellite, the false color image shows clouds and smoke as white, active fires as red, and burned areas as brown. At the time the image was taken, fires had burned 930 square miles of land, and 17 active fires were still raging. On Monday night, winds that had pushed the fires away from Fort McMurray had shifted, redirecting the flames back north. The returning fires were not expected to cause any additional, immediate threat to the largely evacuated town - most of the trees and additional potential fuel near the town have already been burned, according to The Atlantic, and the town is now largely protected by a buffer of ash and char - but to the north regional officials ordered the evacuation of approximately 8,000 workers in the oil sands camps. The fire was said to be moving at 100-130 feet per minute in that area. The BBC reported that fire crews were also trying to control a blaze southeast of Fort McMurray that was threatening an oil installation, and that another fire was burning not far from the Fort McMurray neighborhood of Timberlea. Work is underway to restore essential services to Fort McMurray, in anticipation of the ultimate return of its approximately 80,000 evacuees, but Alberta premier Rachel Notley said that before residents could return, air quality in the area needed to improve substantially. Because of the combination of carbon dioxide, sulfur dioxide and particulate mater in the air, pollution levels are off the charts. Alberta's Air Quality Health Index readings are normally measured on a scale of 1 to 10, with 1 being the highest quality. At the moment, in Fort McMurray, they are at 38. The Fort McMurray fires have burned almost 1,000 square miles of land and are now threatening oil camps.